Get the best iPad app for sheet reading practice! Practice sight reading, rhythm, ear training, and play some songs! Use Piano Tutor with a full size keyboard! 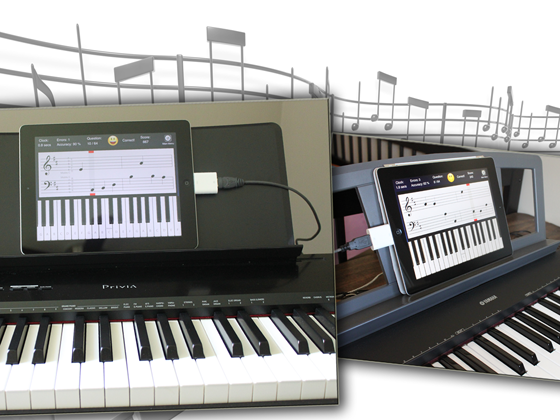 You can connect a MIDI keyboard through Apple's iPad camera connection kit or IK Multimedia's iRig MIDI connector. Want to learn how to read music? This app is for you! Animated lessons, reference tools, fun practice games, this app has it all. Grab a friend and play a duet with the FREE Duet Piano iPad app! "Love your app very much"
"One of the best piano apps for iPad"
"Amazingly versatile and innovative app"
"Really helps you jump the five-line fence"
"This app lays down a great foundation level of learning"
"Tackles learning in a way that few other apps come close to"
"This is a brilliant app."